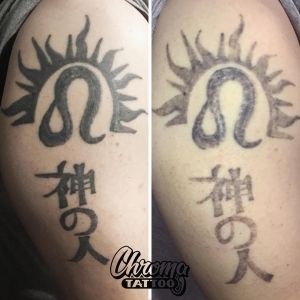 Chroma Tattoo offers professional laser tattoo removal and lightening services to make corrections, improve cover-ups or completely remove your tattoo! Removing a tattoo doesn’t have to cost a fortune. Our pay-as-you go treatments are both affordable and highly effective. Our knowledgeable certified technicians are experienced and their commitment to quality is second-to-none. If you have any hesitation, we offer free, no-obligation consultations where you can learn more about our laser tattoo removal technology and meet our friendly Certified Laser Tattoo Removal Specialists. Chroma Tattoo is fully insured and licensed to perform laser tattoo removal, and our technicians are physician-trained and directed. Best of all, we never require contracts and we will work within your budget. Have you received a quote someplace else? Don’t sign on the bottom line until you get a quote from us - our prices are usually less than half the cost of our competitors! Following your initial consultation, our laser tattoo removal technician will work with you to schedule your first treatment. Often, there is enough time remaining at the end of your consultation that we can begin work immediately! Avoid direct sun exposure for two weeks to the area that will be receiving treatment. Fresh tans can cause hypo-pigmentation complications and may result in us turning you away. Shave the treatment area one day before your appointment. Avoid taking aspirin or other blood thinners for 24 hours prior to your appointment. Do not apply any topical acid products or AHA’s to your skin. Be prepared to complete a medical history form, a release form, and additional paperwork. A photo of your tattoo will be taken for documentation purposes. Additional photos will be taken at the beginning of each treatment in order to track your process. Now, your tattoo removal treatment begins! Following your first treatment, our tattoo removal specialist will provide you with post-treatment care instructions. Your next treatment will be scheduled no sooner than 4 weeks following your initial appointment. It’s crucial that the treated areas STAY OUT OF THE SUN! Remember, if you have a fresh tan, we will NOT be able to provide your scheduled treatment! 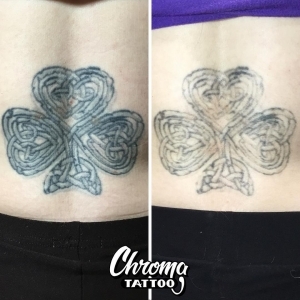 Tattoo Removal: The advanced laser technology employed at Chroma Tattoo is able to remove all colors of tattoo ink, even the most difficult blues and greens. With our competitive pricing and the ability to pay-as-you-go with no contract required, makes us the obvious choice for removing your tattoo! Tattoo Lightening: Tired of the same old tattoo, or regretting a decision you made ten years ago? With our laser tattoo lightening service, it’s out with the old and in with the new! We can lighten any difficult-to-cover areas so that you have more options for the cover-up of your choice. Our laser tattoo removal experts work hand-in-hand with our tattoo artist to ensure that you get the results you’re looking for. Tattoo Corrections: Did a previous tattoo artist make an embarrassing mistake that you’ve been forced to live with? Well, now you can finally say goodbye to that spelling error, poor line work or backward Chinese lettering! Our laser tattoo removal technology is precise enough to allow for even the most minor corrections. Fill out our appointment request form to schedule your professional tattoo removal.